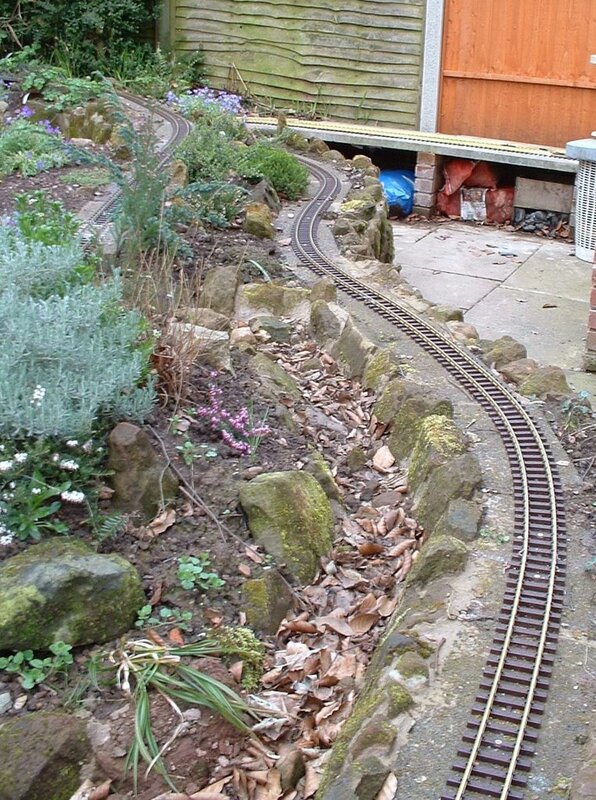 This Blog describes the ongoing development of a 16mm scale 45mm gauge garden railway situated in the North West of England, UK from 2004 to the present day. Winter time is usually when activity on the railway dies down. The weather is not conducive to operating trains outside and the hours of daylight are too short anyway to have a decent running session. It's normally a time when I do constructional projects indoors, but a spate of illness has slowed down my productive output this year. I have managed to turn round a few projects though, and carry out some maintenance. The most significant project has been the construction of a brewery building for the siding at Beeston Castle station. I have also managed, at long last, to replace the fencing behind the platform at Peckforton Station and repair the overbridge which was damaged during tree felling in the Autumn (see Progress Report 75). I have added an Acme Engineering soundcard to the HGLW diesel (see Progress Report 72) and begun the construction of rake of sand hopper wagons for the sand quarry which will be located on another new siding (see Progress Report 75). I have also continued replacing LGB couplings with my less obtrusive compatible wire couplings - a seemingly endless ongoing task! On the operational side, I have updated my freight management computer program with the newly added rolling stock (see Progress Report 74 and Progress Report 75) and a new location (ie the sand quarry siding). I have also found time to make a video showing how the railway has changed over the past twelve years - and also wrote a few articles for the Garden Rail magazine, two of which have already been published. So, I don't think I have been idle over the winter period. The weather is beginning to improve and I have now cleared the track, so it might be possible that trains will start running again in the not too distant future. Over the past year, I have been focusing more on adding lineside detail, particularly industries to the railway. I've added a sawmill at Peckforton (see How I constructed the sawmill), together with a boiler house and water tower (see How I constructed the boiler house and How I constructed the water tower). I have also constructed a water mill (see How I constructed the water mill and sluice gate (see How I constructed a sluice gate) for the mill siding between Peckforton and Bulkeley. In addition, I have made a loading bank for the soft fruit harvest at Bulkeley (see How I constructed a loading bank). These were made from a variety of materials, concrete (loading bank), wood (sawmill) and PVC foamboard (mill, boiler house and water tower). I have become very enthusiastic about using foamboard as it is a versatile material and also relatively cheap. 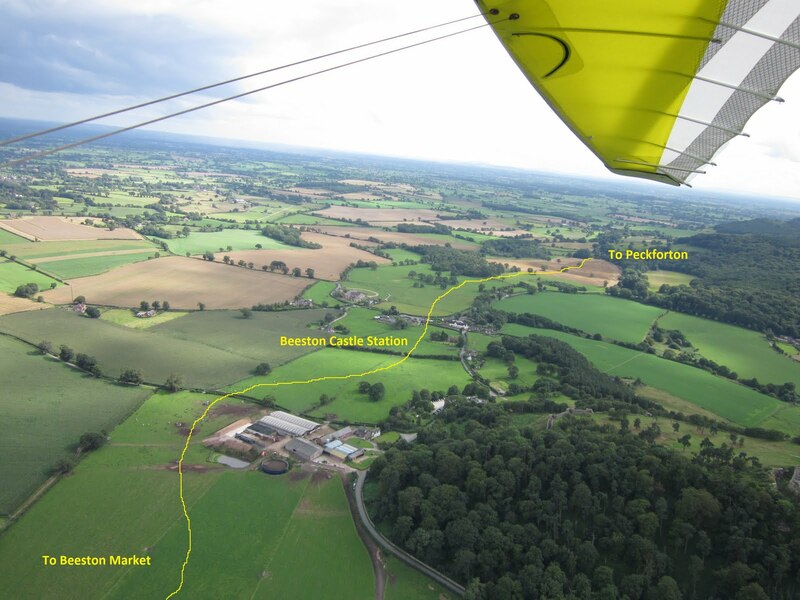 This was why it was chosen for the construction of the brewery at Beeston Castle. before cutting into my stocks of 5mm thick PVC foamboard. While changing the track layout at Peckforton to provide more room for the sawmill (see Progress Report 72), I also took the opportunity to raise the track in the middle of the station where there was a small dip. This meant I had to rebuild the platform (see Progress Report 73) and as a consequence the fencing behind the old platform was removed. Now, after a year, I finally got around to replacing the fencing. I also took the opportunity to create a second running in board which I felt would be appropriate for a station with a single platform. All the original fencing was re-used, though some is beginning to show its age with broken palings. However, I decided that, as my railway is set in the 1930s, at the time of the Depression, then things might have started to deteriorate. The parapets of the two cast concrete overbridges had survived unscathed for eight or nine years until last Autumn when I managed to knock one off while lopping and felling trees (see Progress Report 75). I have now got around to repairing it, using a two-part epoxy masonry repair kit. One crack is still visible but, in time, I'm sure this will fade. After completing the Houston Gate Loco Works (HGLW) kit last year, I decided it was time she gained a voice. I've never used Acme Engineering soundcards and so decided to give one a try (see How I added an Acme Engineering sound card to my HGLW diesel loco). I was attracted by the card's small footprint and because it has digitised real sound effects. Rather than using the 9v battery which came with the card, I opted to increase the battery power in the loco from one 3.7v li-ion battery to two, giving me a nominal 7.4v. Other than that, the installation was very straightforward and the sound quite effective. I had been wondering what industry might occupy the longer siding on the approach to Bickerton station when I happened to pick up a copy of Eric Tonks' book about the Snailbeach District Railways (Industrial Railway Society, 1974, reprinted 2007). I have always been attracted by the wooden hopper wagons which ran on this railway and when I noticed there was a drawing of one at the back of the book, I felt it was an omen. Having a few Hartland Locomotive Works (HLW) mini-series chassis sitting in a spares box, I decided to experiment to see if I could produce a passable replica of a wagon to use as a prototype. Having proved it is possible, I will now produce another seven or eight with improvements and modifications in the process. Once the fleet is completed, I will write up the definitive guide to their production (see How I constructed a rake of Snailbeach style hopper wagons - pending). This is an ongoing process, but I am at last beginning to see light at the end of the tunnel. The design appears to be effective and so around 80% of the stock has now been equipped. I am leaving the locos until last as I anticipate they are likely to be the items which will require the most personalised couplings. As indicated above, this time of year is not conducive to running trains in the garden, but I have made a few changes which will affect train operations once they resume. Because I have added some more rolling stock to the freight roster for the railway (see Progress Report 74 and Progress Report 75), I have now added these to the wagon database in my freight management computer program (see How I handle freight on my railway). 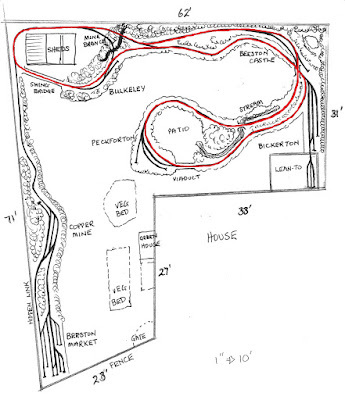 In addition, I have added a new location - the sand quarry, as indicated above. As a consequence, the parameters controlling the movement of each wagon on the railway has had to be revised to take account of this new location. However, this is not as daunting as it sounds, because very few wagons will be likely to serve the sand quarry - a tanker wagon, to transport fuel oil, a flat wagon to occasionally transport pieces of machinery and an occasional closed van for miscellaneous goods. While sorting through some folders on one of my backup disks, I came across some video clips which I had not previously used. These dated back to the early days of my railway and so I decided to make a video comparing these early clips with ones taken more recently. The result is a retrospective video which is not only nostalgic for me, but also shows how much progress the railway has made over the past eight to ten years. 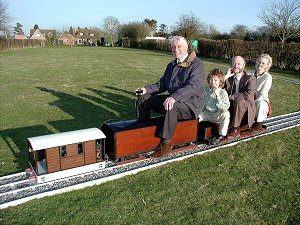 There are always plenty of jobs to be done on or associated with a garden railway. In recent weeks, I have spent some time out in the garden, clearing some of the accumulated leaves and debris which have found their way on to the track, and also cut back some of the plants which are already threatening to impede traffic when the railway resumes operations. As indicated above, a few repairs have also taken place. In addition, I have added a bit more storage in my workshop and also found time to pen a few articles about the rolling stock on my railway. I never seem to have enough storage space. No sooner do I add more and it gets filled and I am looking for some more. I felt I needed a few more shelves to store stock, such as those awaiting repair or new couplings. I speculated for a while how I would support shelves on the window side of the conservatory and eventually opted for a simple belt-and-braces approach with triangular wooden brackets cut from a length of timber shelving. Elegant, they are not, but functional they are. It's a good job I have a partner who is very tolerant of my railway and the way it encroaches on other parts of the house. The shelves are now finished and already full of items of rolling stock and other miscellaneous odds and ends. How on earth did I manage without them? .... and the March 2019 edition. Although some of the information they contain has been covered in various posts on my blog, the articles are completely new and take a quite different stance. I hope any regular followers of my blog will find them equally as interesting and informative. Last year, I constructed an HGLW diesel loco from a kit (see How I constructed an HGLW loco kit and How I detailed my HGLW loco). Most of my locos have sound cards and I thought for a while how I would add sound to this loco. Ultimately, I decided to opt for an Acme multi-cylinder diesel card as I have not had any previous experience with them and wanted to see what they were like. I sent off an email to Mike Ousby (Mr. Acme Engineering) as at the time he was experiencing problems with his website (http://www.acmesteam.co.uk/sounds.html) and, after parting with £40, the card and accoutrements arrived the following day. My first idea was to keep things simple and install the card as a completely separate circuit, using the battery and holder as supplied. However, space was tight inside and under the loco and, although I could have just squeezed the and battery inside the back of the cab, there was no room for the speaker. I decided to use a smaller encapsulated speaker which I had purchased from Rapid Electronics some time ago (https://www.rapidonline.com/rvfm-abs-229-rc-miniature-loudspeaker-rectangular-with-mounting-lugs-35-0293). This would just have fitted in the cab with the card and the battery, however I felt it looked very cluttered, so I decided that, if I doubled the number of li-ion cells in the loco from one to two, the resultant voltage (7.4v) would be sufficient to power the card as well as the loco. Without the need for the 9v battery, this would mean I could easily fit the card and the speaker inside the back of the cab. ..... and the single cell removed from its cradle. Fortunately, I had a spare cell from the same pack that the original cell had come from and so they were matched. NOTE: You should never mix and match li-ion cells. Even cells with the same Amp Hour values may have quite different characteristics. When making-up li-ion packs only use identical cells bought at the same time from the same supplier. I get all my cells from Ecolux who guarantees the quality of the cells he supplies and will attach solder tags for free. He will also make battery packs of any size and shape on request. The two were wired together in series with a 2S li-ion battery protection board and re-mounted on the cradle. My next decision was how to supply power to the card. The simplest way would have been to wire it up directly from the switch supplying power to the receiver and another lead to the negative supply to the receiver. This would mean that the sound would come on all the time the loco was turned on. It would also mean the sound would continue when the loco was stationary. My next thought was to wire in a new switch to enable the sound to be turned off independently of the receiver and motor. But then I remembered that the Deltang Rx65b has outputs which can be controlled by the transmitter. I would just need to use one of the three buffered outputs (A, B, C or Pads 13, 14 and 15) which are capable of switching up to 2 amps. Simples! So, a two-pole plug was wired-up, the red lead connected to the output from the switch going to the Deltang Rx65b receiver, and the black lead connected to Pad 15 (C) of the receiver. This pad would give me a switchable 0v output in response to the bind button (Ch5) being pressed on the transmitter. However, the output from P15 is momentary by default, ie 0v is only supplied while the button is being pressed. I wanted to change the output to latching, so that it would toggle from off to on and vice versa when the bind button was pressed. This required the receiver to be re-programmed. This was done by binding the receiver to one of my Tx20 transmitters and putting the transmitter into programming mode. (see How to reprogram a Deltang receiver with a Tx20). The coding used to reset Pad 15 to latching output was 3, 15, 2, 5, 3. (ie Menu 2, Pad 15, latching output, Channel 5 (bind button), start high and toggle when the bind button is pressed). This might sound like gobbledegook, but hopefully reading through this section on another blog post might make it clearer - How to look up programming codes for Deltang Receivers. The leads from the two-pole socket were passed through from the bonnet to the cab, through a couple of small holes between the feet of the driver. The power leads were then connected to the Acme Engineering soundcard. The speaker was then also connected. The red jumper lead was left in place on the soundcard as I wanted the sound to repeat continuously. Fully wired-up, the circuitry looks like this. As can be seen, the two li-ion batteries are connected to the protection board before the board passes power to the switch. The board protects the batteries from short circuits, over-charging and most importantly, over-discharging. 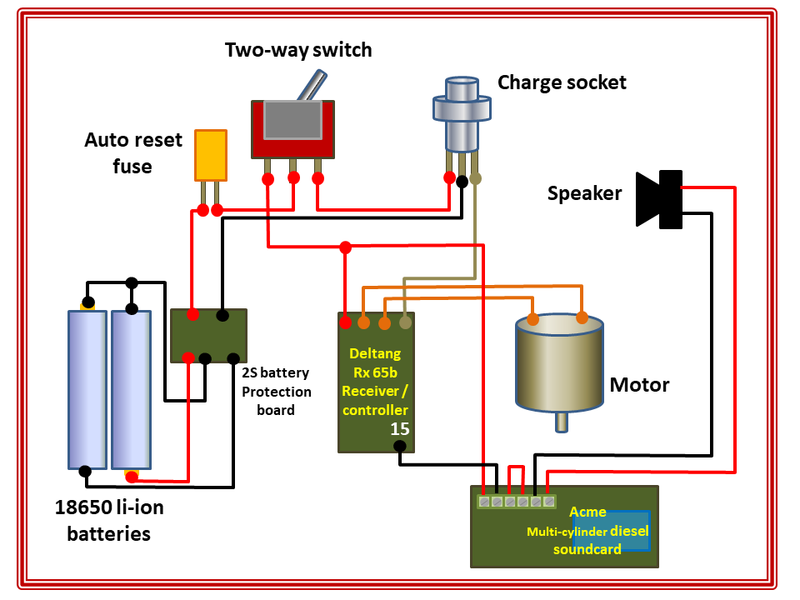 If the charge in a li-ion cell falls below 3v, then it will become permanently damaged. The auto-reset fuse is not really necessary with the protection board, but was already wired-in on the original circuit and so I left it in place. You'll notice also that the sound card is wired-up to Pad 15 (aka Pad C) to provide 0v (ie the negative supply) when the bind button is pressed on the transmitter. The positive supply for the sound card is provided by tapping into the lead from the switch to the receiver. I use both the two-way switch and the built-in isolation switch in the DC socket to ensure that the receiver cannot be turned-on accidentally while the batteries are being charged. Either one or the other would be sufficient, but I have now got into the habit of using both. .... and the speaker and sound card stuck inside the back wall of the cab where they are reasonably unobtrusive. I might eventually cover them with some cream coloured card, but for now I hardly notice they are there. The loco was then reassembled and taken outside for testing. The sound isn't loud, but that might be because I am using a smaller speaker than that provided. However, the digitised sound is realistic and varies slightly as the loco trundles along. The pace of the sound doesn't vary in relation to the speed of the loco however, and there is no engine start-up and wind-down as is provided with the MTroniks soundcard. However, the MTroniks card is more expensive and is not supplied with a speaker, battery, switch (which I didn't actually use - but will go into stock) and wiring. I do feel that adding sound to a loco out in the garden is quite important as it adds to the atmosphere. I tend to keep the sound turned down on all my locos as I don't want to disturb the neighbours or their dogs and also am not anxious to draw attention to the passers-by that there is a railway behind that fence. So I am not anxious to increase the volume of the sound in this installation. As long as I can hear it, that's all that is needed. The Acme Engineering sound card is a relatively inexpensive way of adding sound to a loco. My installation is a lot more complicated than it needed to be. The simplest approach would have been to put the whole thing in a truck which is towed behind and this would have the added bonus that any loco towing it would be given a voice. 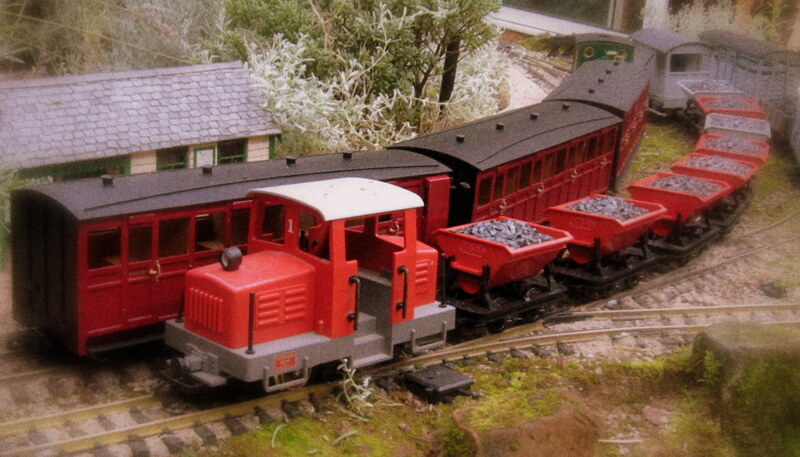 However, I like my locos to be self-contained and enjoy the challenge of tailoring an installation to suit my needs. This blog describes ongoing progress in the development of a G gauge Garden Railway from its inception to the present day. 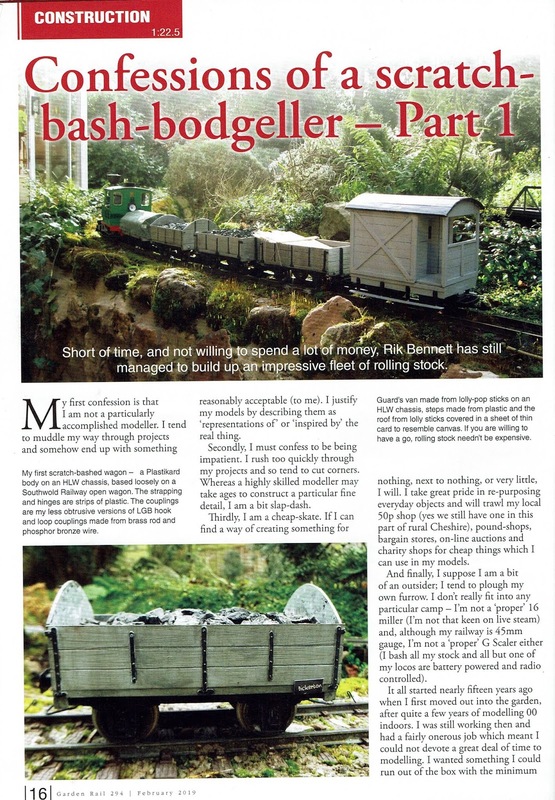 When I became interested in building my own garden railway I spent a considerable amount of time (and money) on books, videos, DVDs and scouring the internet for information, ideas and inspiration. When I eventually started construction I used some of the ideas I had discovered, but also experimented with my own approaches. 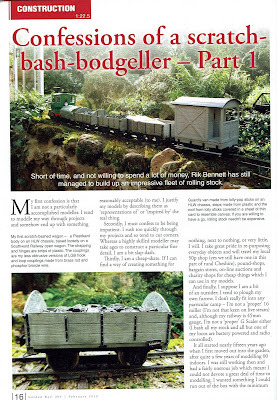 This blog outlines how I have gone about constructing my own garden railway. My aim is to provide the sort of information I was looking for when I was getting started and also to share what I've learned (or 'borrowed' from others). I've tried to include a few 'How I ........' postings interspersed with occasional 'Progress Reports'. I do not profess to be any kind of expert - what I offer here is an opportunity for you to metaphorically look over my shoulder to see how I have gone (and am going) about this fascinating hobby. As this is a blog, the various posts are presented in reverse chronological order (ie the most recent first). To see a categorised list of contents go to the Blog Contents Page. If you are thinking about building your own garden railway then why not join the 16mm Association or the G Scale Society - you'll get plenty more advice and opportunities to visit other peoples' garden railways. Alternatively, browse through the G Scale Central website - there's plenty more guidance here and an opportunity to sound out the views of others through the G Scale Central discussion forum. The advantages of blogging are that it is immediate and uncomplicated when creating and uploading information. The other, of course, is that with Blogger it is free. The major disadvantage is that I have minimal control over how the postings are presented. The blogging system adds the most recent information to the start of the blog, hence the postings appear in reverse chronological order (most recent first, oldest last). Whilst there is a list of postings on the right hand side, it's not particularly easy to see what is there. This introduction is an attempt to provide you with a contents list of the postings organised into categories so, hopefully, you see if what you are looking for is presented in this blog. To ensure that it always appears at the start of the blog, I update its content and set its presentation date into the future each time I add a new posting. What sort of railway do you want? What sort of layout would suit you best? How will your railway be operated? How will your locos be powered? Where and how will you store your rolling stock? I suppose I've been planning the installation of a garden railway for most of my life, since I first became interested in model railways around sixty years ago. After a couple of abortive attempts, my plans came to fruition around fourteen years ago. I could argue that I have had over fifty years experience of planning garden railways - though most of those plans were little more than pipe dreams. When I knew my planning was for serious implementation, I spent around three years, drawing, doodling and mapping, before I had a plan which I thought was going to be workable and provide me with the operating potential I craved. This blog post is really a summation of that experience, which I hope might prove interesting and useful for anyone who might be intending to step out into the garden with a spade and a length of railway track. I hasten to add that I do not profess to be an expert - I am merely passing on some ideas which I have gained through experience. 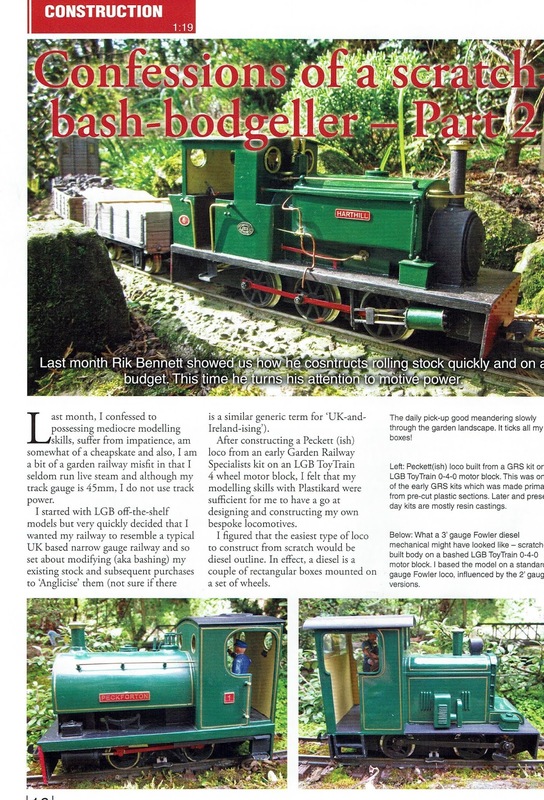 This question may seem somewhat fatuous, but it is surprising that, over the years, I have seen several examples of garden railways which were created, then modified, neglected or abandoned because their owners appeared unsure as to what they were actually trying to create. or represent a real or imagined working railway? Where will your workshop be located? How close will your track run to the workshop (or even inside)? If you adopt this type of railway it will probably also, at times, be used as a test track as new stock is bought and/or built. So, the above questions will inevitably still apply. The track on my railway runs alongside the conservatory which houses my workshop and so I am able to nip outside and test run stock with ease. I know that some people buy their rolling stock more randomly and hence their railways take on multiple personalities, dependent on the stock which is being run at the time. In some ways, this type of railway is a sort of test track, but with added scenic features. The setting is less important for them than having somewhere to run various types of train. By contrast, I know of a couple of modellers who have rationalised their desire to run varied types of stock by creating a fictional preservation society which has amassed a wide-ranging collection of stock. For example, my railway represents a hypothetical narrow gauge branch-line which might have served the copper mines and local communities in rural Cheshire; the locality in which I live. So, the choice of rolling stock was determined by the sorts of traffic which would travel on the railway - copper ore and spoil, agricultural and domestic supplies, livestock and passengers. 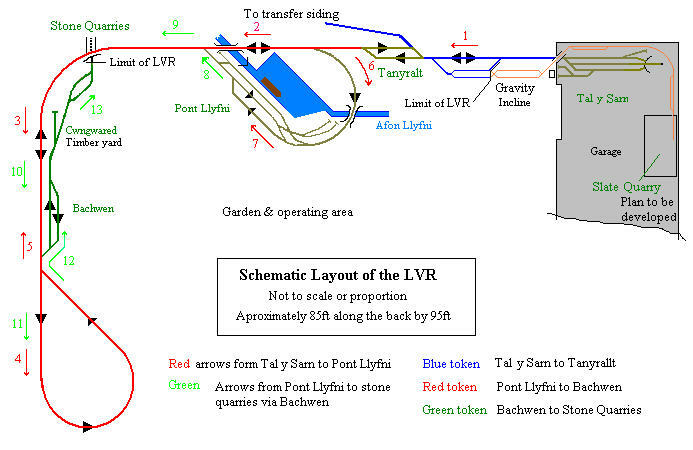 I am aware of modellers who have recreated sections of the Isle of Man Railway system (eg see https://sites.google.com/site/iom15milgroup/home ), the Welsh Highland Railway (eg see https://gardenrails.org/forum/viewtopic.php?f=41&t=6418 ) and the Southwold Railway, (eg see https://youtu.be/sKZOFd3oez8 ) whilst others have created imaginary extensions to real systems which could feasibly have been constructed. Although it's not essential to give your railway a setting, I've found that it does add to the enjoyment. The fact that my railway is set in a real location is an added bonus - as I walk or drive (or even fly over) the supposed route, my imagination creates the sights and sounds of one of my trains passing by. Whilst my railway is set very near to where I live and so background research is quick and easy, if the real or imagined setting for your railway is some distance from where you live, Google Earth is a good way of visiting the locations virtually to see the lie of the land. Having decided on the sort of railway you want to create, the next stage is to survey the intended site. You can be as sophisticated or as basic as you like. I've known of modellers who have painstakingly measured their back yards and then used 3D modelling software to recreate the intended site on their computers. By contrast, I surveyed my back garden with a tape measure to get a general idea of the size of the site and then made numerous sketches of possible layouts which might fit it (see How I planned my railway). You need to decide on the scale of your model and the gauge of the track. Garden railway modellers tend to opt for large scale models - there is usually plenty of space for reasonably realistic layouts and larger models look more at home in the garden environment. The choice of scale and gauge can be quite baffling to a novice modeller (and sometimes even to quite experienced modellers!). I will attempt a simplified explanation, starting with the largest scales and working downwards. These tend to be somewhere between 12" and 3.5" gauge and a variety of scales, dependent on whether the model depicted is standard or narrow gauge. SM32 16mm scale 16mm = 1 ft (1:19) 32mm Represents 2' narrow gauge railways. Most common in UK. Ready-to-run (RTR) models and kits are available for most scale and gauge combinations but some (eg G Scale) have a greater range and availability than others. So, your choice of gauge and scale may be dependent on your budget, your skills of model construction and the availability of relevant models depicting the sort of railway you want to run. In my case, when I started my garden railway (in 2004), there were plenty of off-the-shelf (RTR) models in G Scale and very few in 16mm scale. As I had a demanding job, I opted for G scale as I figured I would have insufficient time to make my own kits or scratchbuild models. However, as I wanted my railway to represent a UK narrow gauge railway, I had to adapt the available RTR models which were mostly of continental or US prototypes. If I was making the same decision now, I might well choose SM32 as there are far more RTR UK-based models available. Once you have decided what type of railway you want to operate, the amount of space you have and the scale and gauge combination which will suit your needs the best, you then need to consider what type track to use. What sort of track will you be using? Sectional track is very useful where space is tight or you may want to change your layout in the future. Sectional track is easier to lay than flexible track and gives inexperienced modellers the reassurance that curves are uniform and that stock from the same manufacturer will be able to negotiate them. 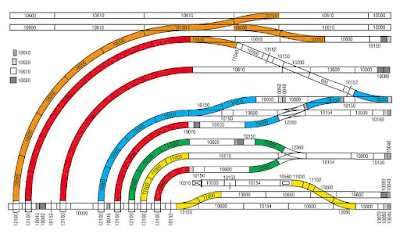 There are computer programs which enable you to plan your layout, the more advanced programs include the most common types of commercially available track sections to 'build' your layout on screen (eg see https://www.anyrail.com/en). These programs are particularly helpful if you have a small or constricted site where space is at a premium and you want to maximise the potential of the space available. The beauty of flexible track is that you can lay the track to match your landscape rather than vice versa. Curves can be flowing with gentle transitions from the straights to give a more realistic appearance. 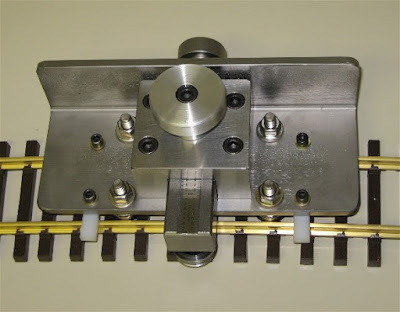 However, flexible track has a tendency to try straightening itself out and so either has to be fixed down to a firm base or curves need to be made with a rail-bender. I used flexible track on my railway, largely because that was what I was used to with my indoor model railways. I've never used a rail-bender but fix my track down to concrete blocks with screws and rawl-plugs or to wooden planks on the raised sections. Something else you will need to consider is what length of train will you intend to run? This will dictate the size of run-round loops at termini and passing-loops at intermediate stations. I decided that, on my narrow gauge railway, goods trains would be limited to eight wagons plus a guard's van and passenger trains to three coaches. This meant that each loop needed to be at least 2 metres in length. All my locos are quite short and so, if you are intending to use larger locos, then you will need to take account of that when planning your layout. You will also need to work out the optimum length for sidings at your stations, dependent on what sort of goods and passenger traffic you are planning to use.The majority of sidings at my intermediate stations face in one direction. This means that shunting is easier when a goods train is travelling Up the line rather than Down. I've discovered that this mirrors practice on real branch lines. This is, in effect, a circle of track. The circle could take the whole garden to negotiate and even cross over and/or double back on itself in a figure of eight, as it does in my garden, but if a train can carry on from where it started without reversing, then it is a continuous circuit. 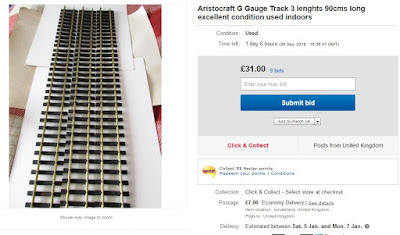 This is particularly useful if you have live steam locos and want them to run around the track without too much interference, or if you have visitors and just want to have a train running while you entertain them. I have a continuous run on my railway, which I use from time to time - for example, while I'm doing some gardening. As you can see from the red line on this plan, the circuit crosses over itself to make a figure of eight. Sometimes also called 'Terminus to Terminus'. If you think about it, most railways operate 'end to end' - trains travel from one terminus to another, with various stops in between. Only rarely do they operate continuous runs (eg the Circle Line on the London Underground). End to End running is quite satisfying if you want to run your railway realistically, but it does require the operator to control the trains rather than set them running and leave them, as is possible with a continuous circuit. I have end-to-end running on my railway. 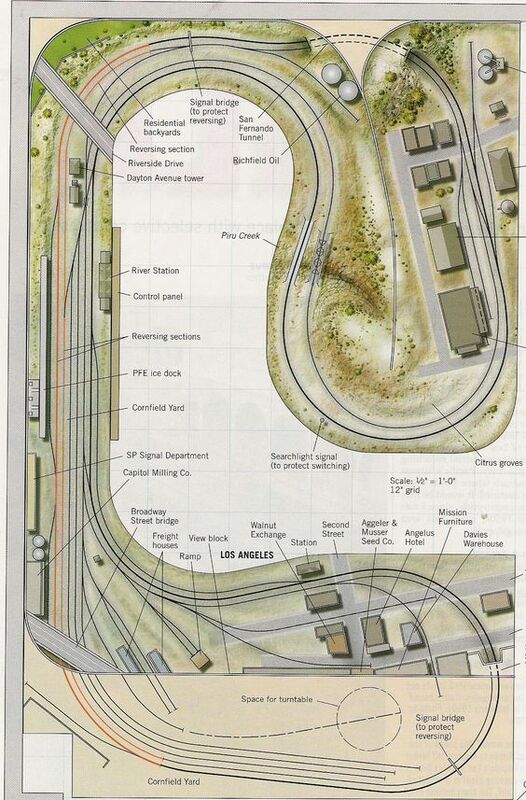 I can run trains from one terminus to the other as shown on the plan below. In reality, the trains run through every station rather than taking a short cut as shown in green on the plan. As implied by the name, a train runs out of a terminus, negotiates a reverse loop (or balloon loop) and returns to the station. The operator can focus on train movements at the terminus, despatching and receiving trains which happily chuffs (or chugs) their way around the rest of the garden. I have a reverse loop on my railway which enables me to send trains out and back from either of the two termini. Rather than the short out and back route shown in blue, the train can also traverse the rest of the continuous circuit before returning. 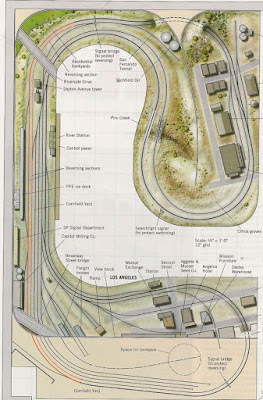 I find this useful when testing new locomotives or just having an impromptu running session when I can run a train out of the storage sidings in the lean-to and then after a few circuits, run it back into the storage sidings. of course, as with my layout, you can combine together any of the above elements to make a more interesting and flexible track plan. The more options you include in your plan, the less likely you will tire of it. I would also suggest, at the planning stage, incorporating possibilities for future expansion if space permits. My present layout has grown over the years as funds and time have permitted. or will you try to represent real railway practices and shunt goods wagons into and out of stations? Another fascinating insight into operations on a garden railway is provided by the Llyfni Vale Railway and Harbour Co.
Before cutting your first sod, you might want to spend a while with your plan, working out what trains could travel where and when to transport goods around your railway. Better to screw up a few sheets of paper than have to rebuild your railway at a later date! ..... though these generally require considerable ingenuity on the part of the modeller. You might start out with the intention of having very little rolling stock and then just carry out into the garden only the locomotive and coaches or wagons which you want to run during a particular running-session. If so, a few plastic crates will be sufficient for your needs. However, it is quite amazing how quickly a collection can grow and before long it is likely you will find the business of carting out a series of crates and boxes a disincentive to running your railway. Provided you have a suitable space (eg a garage, outbuilding or spare room), then portable cassettes are a preferable alternative to miscellaneous crates and boxes. Whole trains of rolling stock can be stored in the cassette and rolled out on to the track directly from the cassette saving considerable time and effort. I used cassettes on my railway - with one cassette for each siding on the railway so that I could store wagons and coaches exactly where they were at the end of a running session and restore them again at the start of the next session. They were made simply from a few sheets of shaped plywood and made stackable so they could be stored in the lean-to. If you have somewhere to store your stock which is on the same level as your railway, then you could consider making a mobile train trolley, such as this made by fellow modeller Bob G (Trent Valley Branch Line). 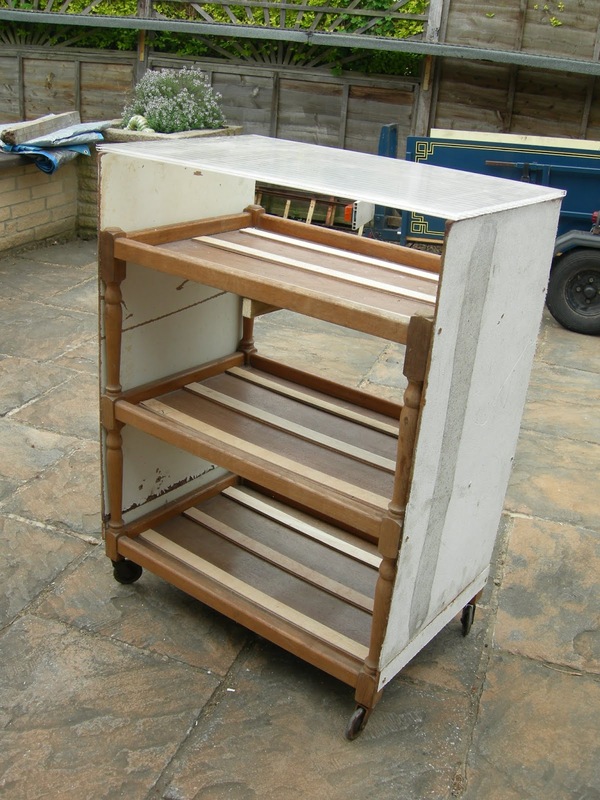 As you can see, it is a modified hostess trolley with wooden battens set the the gauge of the track. It saves a lot of lifting and carrying. If you have a suitable shed or outbuilding then storage sidings provide a great way of storing stock when not in use. The great advantage is that the stock need never be handled and so is less likely to suffer accidental damage. Another advantage for me was that, having slipped a couple of disks in my neck, I was finding carrying the cassettes in and out exacerbated the problem and so, the sidings have been a boon. As all my locos are battery powered, I was able to save on track for the sidings in the garage by using stripwood rails. If you have sections of your railway on wooden or plastic boards, then you could create storage shelves or even sidings beneath your railway. The storage shelving could be made weatherproof and secure to protect your stock from damage or theft. You could use cassettes to ease the process of transferring the stock from storage to track. For a while, I used my cassettes with storage sidings in the lean-to until my collection of goods vehicles (now more than 70) outgrew the space. I store my locomotives inside the house, where controlling the temperature and humidity is easier. Although my locomotives are not wildly expensive (I mostly make my own), I would be devastated if they were stolen and so prefer the added security which my burglar-alarmed house offers me. A consideration you will have to make when planning your railway is deciding on the most suitable way to store your collection of rolling stock - taking account of future plans for expansion. Of course, with unlimited funds we would all want to build complex and ambitious railway systems in our gardens but, in reality, we are constrained by the limits of our budget. 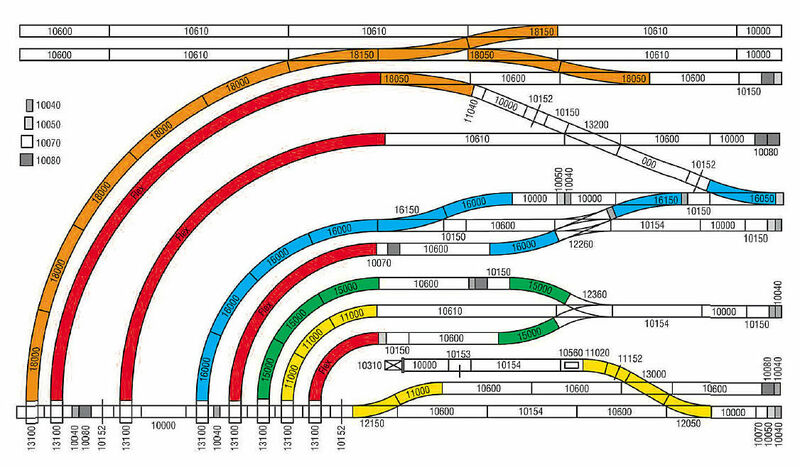 As indicated above, the whole railway does not need to be completed from the outset. A simple circuit can be extended over time. One way of making meagre resources stretch further is to buy secondhand track. The majority of my track was pre-owned. 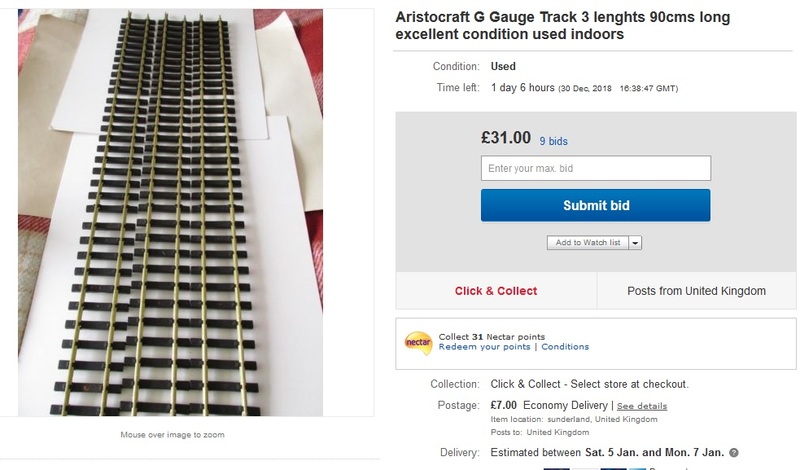 Track intended for garden railways tends to be quite robust and so it is possible to buy track from other modellers' abandoned schemes at reasonable prices. 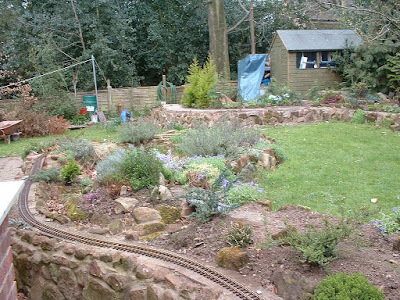 Generally, the most effective garden railways are those which have been landscaped to most effectively fill the space which has been allotted to them. There are some spectacular garden railways in existence with mountain landscapes, towns, villages, waterfalls, streams and impressive infrastructure. However, some of the more modest garden railways are equally remarkable for their subtle use of landscaping. Some garden railway modellers prefer this type of railway as it blends into the pre-existing garden with the minimum of additional landscaping. There is something very pleasing about watching trains weaving in and out of patches of growing plants. If your garden is sloping, then a ground-based line can become even more interesting - keeping the track level but building-up and/or digging into the ground with embankments and cuttings, much like the real thing. do not always show off the rolling stock to its best advantage. Bending becomes increasingly more difficult with age and so, if you are intending to keep your railway in existence as you head towards maturity and your dotage, then you might want to consider whether a ground-based line is the most efficacious. Live steam locos need to be re-fuelled, oiled and tended-to; rolling stock will inevitably need to be re-railed and coupled/uncoupled and you will want to see more than the roofs of your rolling stock as it traverses your railway. Whilst it is possible to see or photograph your rolling stock by lying on the ground, it is not always an attractive proposition if the ground is wet. Raised beds offer a compromise between a completely ground-based railway and an elevated railway. Raised beds can be constructed from wooden edging, wooden sleepers, brick, concrete blocks, stone or simply rammed earth. They enable you to have the benefits of a ground-based railway (ie watching your trains negotiate a miniature, growing landscape) with those of an elevated railway (ease of maintenance and getting a better view of your rolling stock). However, raised beds have to be constructed and so require a fair degree of investment in both cash and time - unless your garden already features them. The majority of my railway is on raised beds - ranging from around three inches above the surrounding garden, to two feet. Once I had decided on the track plan, it took me around a month of part time work to landscape the garden, moving soil from the sunken areas to the raised areas and building the retaining walls. I used concrete blocks clad in sandstone. Constructing a garden railway on raised boards is a great way of showing off rolling stock and also helping to prevent back problems. 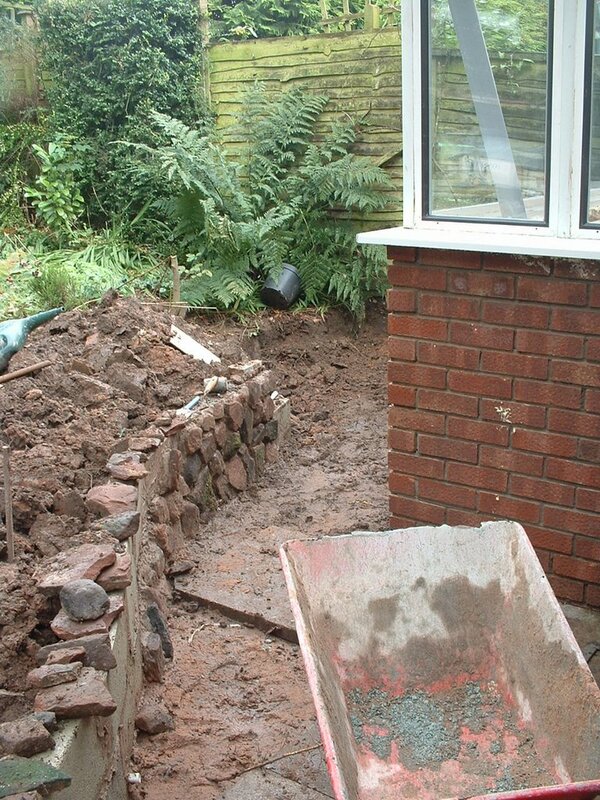 It's also a good way of overcoming difficulties landscaping a sloping site. It's also a relatively quick and easy way of getting a railway up and running - driving posts into the ground and interconnecting them with the trackbed is far less onerous and time consuming than creating a trackbed on the ground or making raised beds. The drawback is that it is more difficult to create a scenic backdrop to the railway. Part of my railway is on raised boards, where it runs along the edge of the garden beside a fence and raised beds would have been difficult to construct. To disguise the boards, I have grown a hedge beneath and behind the boards. 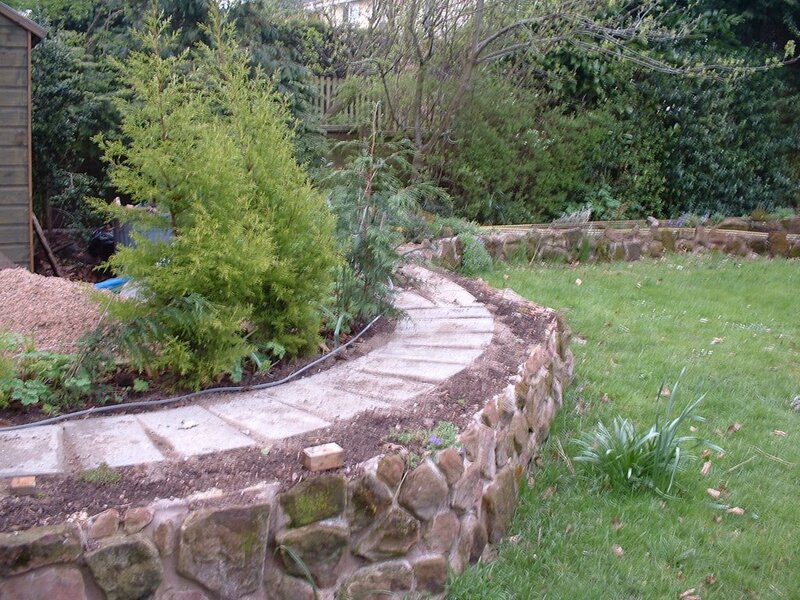 There is no reason why you can't have part of your railway at ground level, some of it on raised beds and another section on boards - particularly if you have a sloping site or you are prepared to include gradients. Garden trains can cope happily with gradients up to around 1:40, but any steeper and you will start restricting the length and weight of trains your locos will be able to haul. One of the most essential pieces of equipment you will need when constructing your railway, no matter whether it is ground-based or raised, is a decent long spirit level. This not only ensures you keep your trackbed level, it can also be used to construct regular gradients. You will need to plan carefully for any gradients on your line. As indicated above, the maximum workable gradient is 1:40 - you can go steeper but it will limit the trains you are able to haul. To give you six inches (150mm) clearance needed to allow one track to pass over the over, at 1:40 you will need 240" (ie 20 feet or 6 metres) of gradient. You will also need to ensure that the gradient is evenly spaced along that length - which is why the spirit level is essential. If you are intending to run live steam locos without radio control, then you will need to keep the track as level as possible and try to avoid too many sharp curves. Manually operated live steam locos are adversely affected by gradients and curves which can lead to a fair degree of frustration. I took around three years to plan my garden railway before I actually laid hands on a spade. That time was spent accumulating funds and buying the raw materials I needed as I eventually decided that, to get the most out of the space I had available, I would have to engage in some serious civil engineering (including building the lean-to on the right of this photo). However, your plans might be more modest. Some modellers start with a circle of track laid around their existing lawns. In the meantime, drawing up plans costs nothing, apart from a little time. And the more plans you create, the more likely you are to come up with an idea which motivates you to grab that spade and start digging. Here you will find a topic list of over 250 blog postings describing the development of the railway since 2004. Where did I get my ideas from? How Did I Lay the Track?